This week our youngest child turned four and the last of the baby-gear items left our house. The item in question was our trusty Ergo baby carrier which we had kept in our minivan (aka the rolling jail), for just-in-case occasions. But this last week we also said goodbye to the a/c-less minivan (and hello to a blissfully cool SUV), and when cleaning out the minivan I realized it had been months since we’d used the carrier. It was time to bequeath it to a new family. In so many ways, it’s the end of an era. We are officially a house where no bicycles have training wheels, no-one except Mommy needs to nap, all seat belts can be buckled by their occupants, and everyone can wipe their own butts. (<< note I said can, not does. There’s yet work to be done.) It’s been a long nearly-nine-years but we have made the transition from being the parents of babies and “little people” to being the parents of articulate, opinionated, growing-in-competence, medium-sized people. There are some really beautiful things about this change. We all usually sleep through the night. They can tell me where it hurts, and they laugh at jokes. Sometimes, when the planets align and all my mommy-mojo is at work, they play nicely together and I can read a book while the children are awake and occupying themselves. I mean WHAT?! Really?!! There were a couple years there that I didn’t think that kind of daytime luxury would ever be mine again. For these changes in season, my primary emotion is one of gratitude. There are also moments of unmitigated sentimentality. 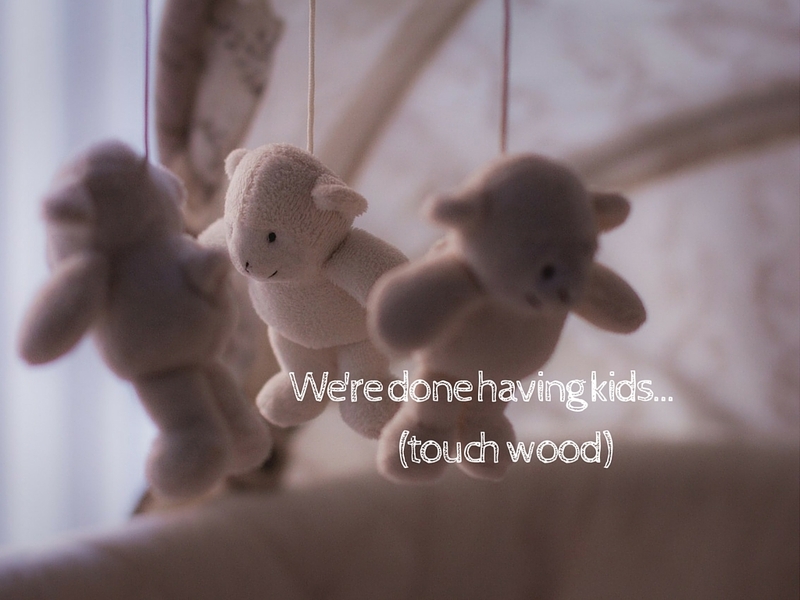 Like the day we dismantled our youngest’s crib and left it to rest in pieces, and there was something so sudden and unexpected about that change that I cried on and off for several days about it. Every now and then one of my kids will climb into my lap and ask me to read them a story, and I know that one day it will be the last time and the thought catches in my throat. But that time isn’t today, and so I read and try to keep the schmaltz at bay. But between the gratitude and the sentiment, I just wanted to confess one more feeling: fear. For I know a handful of people who were just settling into this sweet post-toddler zone I’ve been describing, who had just given away the last of their baby gear, only to discover that—surprise! surprise!—they were pregnant again. And lest you think we only keep company with Natural Family Planners who rely on calendars to keep them child-free; let me say we’ve heard this story from people who’ve taken permanent steps to stop them brooding breeding. So this week, as my children buckled themselves into their seats and I drove across town to drop off that last baby item to a new foster family… I’ll confess I felt a little fear. Because what if this is our story, too? Just when we feel we survived the baby-years and are settling into the sweet season of the elementary years? Well, I guess we’ll cross that bridge should we come to it. We had been hemming and hawing about if and when to have a third kid when God short-circuited our decision-making with a surprise pregnancy… and he was possibly the best surprise ever. We have laughed more and loved more every single day on account of that unexpected little boy. And I suppose that even if we were to have a (VERY!) surprise fourth, we would look back with gratitude and a “we couldn’t imagine life without them” testimony. But for now, as I look at my baby-gear-free house, what I feel mostly is a quiet gratitude for the years past and the season we’re in. We have three kids and that seems a good number to us. The bakery is closed: no more buns will be baked in this oven… that we know of. That’s our plan, but I know from experience that God pays little attention to my plans. So I’m giving away that baby gear, but—as with all things—leaving room in my soul for some divine mischief and mystery. enjoy this new phase of life! When you’ve packed that SUV with their college stuff to drop them off at their freshman dorm, that’s when you know the baby days are long gone! YIKES! We are a (long, short) time away from that 🙂 But, for what its worth, even though I left home 22 years ago, my Mom still calls me “my baby” and I still call her when I’m sad just to hear her say the South African equivalent of “you poor thing”… so in some small ways things haven’t changed over 40 years! Well done for biting your tongue 🙂 I don’t know I would have had that restraint. I love the expression that we “yearn and mourn for the passing time”: such a great way to put it. Love you, friend. There have been times when I’ve looked at my two daughters, now ages 13 and 8, and realized that one of them is only five years away from college, 2-3 years away from driving, and all those long-gone baby days seem so easy. Relatively speaking, of course. But they were able to be contained much, much easier by a crib or car seat. When I packed off all that baby stuff, I was thankful to be done with it. But when the teen has an attitude and her sister is squalling and I’m tired, sometimes I wish I could put them both in a crib and let them cry it out. Then again, it doesn’t take too much time to get loaded up for school each morning and I can read a book without someone needing me to take them to the potty! Each season has its good aspects and bad aspects. Enjoy the middle years. Enjoy the young years. Enjoy (if you can) the teen years. God has amazing things in store for his children! And my baby had her last high school final exam yesterday and heads off to college in the Fall. Everything makes me cry right now. The parenthood experience came later in life, and what a joy it has been on a daily basis to be a mom and be a family together. I’m thankful for a good marriage, but the house will feel very empty in a few months…it has gone by very fast.